Why open a savings account with EQ Bank? I was talking to a few of my classmates last week and we stumbled on the topic about savings account. I yelled EQ bank with gusto. All my nursing peers had no idea about it. One of my friends placed her arms akimbo. Another grimaced. My cortisol level skyrocketed. Heck, why did I yell EQ bank? 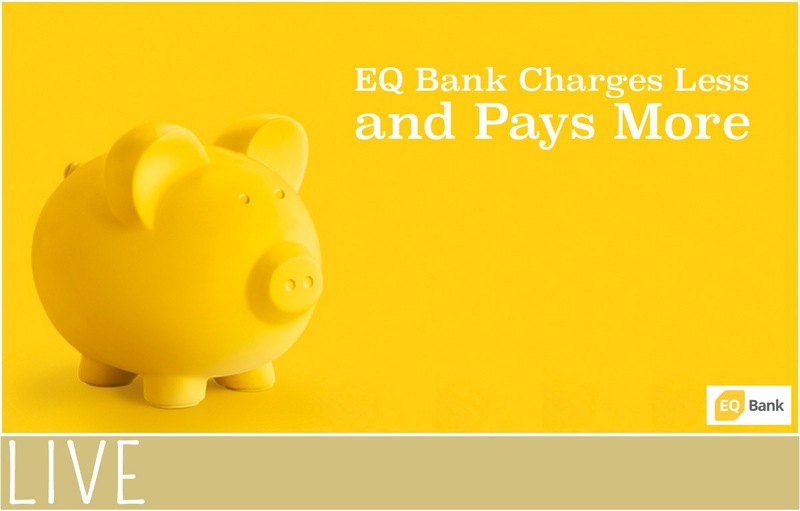 EQ bank made some noise in January by pitching in an attractive 3% return on savings. Obviously, I jumped on it and started earning a solid three percent return. However, on April 18, 2016 – EQ dropped their return on savings to 2.25%. After exchanging a couple of emails with Rob Carrick, I figured EQ would reduce the rate again in a couple of months. Here s the link to Rob’s newsletter. Furthermore, new customers will be asked to “reserve a spot” when signing up. Be ready to be on the “reserve list” for a few weeks but I firmly believe it’s worth it. Also, if you call EQ about your account getting activated or just to find out the status of your account, don’t be surprised to be on hold for 35-45 minutes. I went through it but again, I feel it’s worth it. EQ replied to my emails after 3 business days. Why is EQ so slow on calls and have a “reserve list”? I don’t know. I would assume this happened as more Canadians became aware of EQ’s delicious return on savings and the demand overwhelmed EQ’s customer service department. For my friends in Quebec, EQ is not available in Quebec. There are no bank branches because EQ deems they are costly to run. Everything is online. Millennials must be smiling quietly. I am one of them. On their website, EQ states “We prefer to operate online and share our cost savings with you, by offering one of the highest rates on the market and other perks, like 5 free Interac e – Transfers per month. Feel free to compare”. Indeed, a bold statement. Here’s a link to a cool site that compares high interest savings account. One can sign up online without mailing in the documents. Once your check has been received, your account should be activated in 7-10 business days. EQ will send you a welcome email. I would like to confess I made a mistake by asking my other bank for a money draft instead of a personal check. Wrong move. Make sure you order your personal check if you want your account to be activated sooner than later. Okay, I was being frugal and don’t panic, if you happen to make the same error. Do what I did. Go back to the same branch where you obtained your money draft and ask them for a refund POLITELY saying you no longer need the money draft. If this is your first time, they will happily refund your money back. EQ is a member of Canada Deposit Insurance Corporation (CDIC). For rookies like my nursing classmates, CDIC is the federally backed agency that protects savings deposits for up to $100,000 each. Your money is safe gals xoxo. Now, is there a catch? The appealing return on savings won’t last but I believe EQ will stay competitive. As mentioned earlier, there are no bank branches and there is no debit card issued with your account. Just incase, my classmates get mad at me and complain, how come I didn’t get a debit card? I was comparing my interest earned from my savings account at my other “big” bank after a couple of years and the interest earned from EQ after a couple of months. I smiled. This was during my exam week. My cortisol level dropped significantly. Lastly, forgive me for invading your personal affairs, but let me ask: Do you know how much interest are you earning on your savings account? Next Post Do you know your credit score?